9x12, xvii + 186 pp. 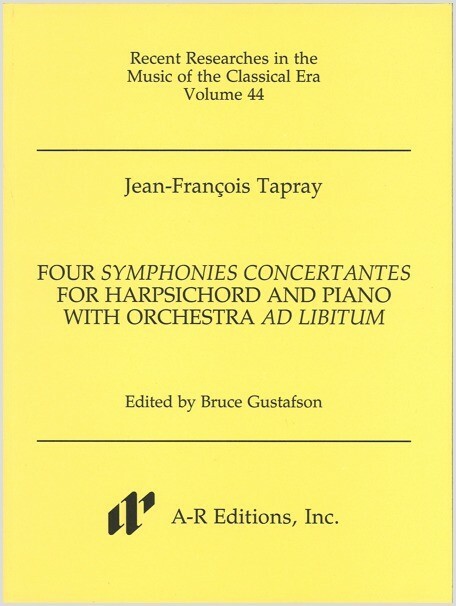 These four concertos, published between 1778 and 1783 as Tapray's opuses 8, 9, 13, and 15, are for the unusual combination of piano and harsichord with an orchestra of mainly strings (op. 8 adds a pair of horns, and op. 13 adds a solo vioin). Hitherto thought lost, the discovery of the harpsichord part for op. 13 was the stimulus for this edition. Op. 15 is notable as the last French work to require a harpsichord, marking that instrument's demise in the face of the emerging fortepiano.